I don't make it to Keokuk often, its more like a stop on the way to St Louis or parts further south for most Iowans. The pork tenderloin sandwich from Hawkeye Restaurant was mentioned at some point in USA Today as one of the best sandwiches in America. Location: 105 North Park Drive in Keokuk, Lee County in far Southeastern corner of Iowa. Directions: This is just off Highway 61 on the State Highway 218 route on the north end of town. 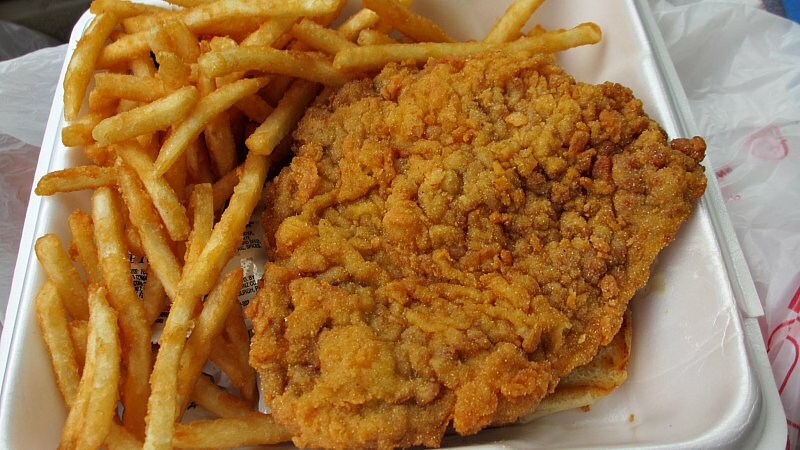 The Tenderloin: This was visually appealing with a great golden brown color and wrinkles of fried breading. The meat was tenderized and included some darker sections and small bits of rendered fat. Juiciness was above average with steam arising from the sandwich. Served on a large toasted bun overall 7.9 out of ten. Price: $7.49 with a side for dinner. Also on the menu: The gigantic menu includes steaks, seafood, pasta, and a "create-a-gumbo" option. You can take home their house sauces by purchasing at the front counter. Service: There is table service but I just grabbed takeout from the front counter. Ambiance: The popularity of the Hawkeye meant they outgrew their old location in a historic building in downtown Keokuk. The current location is huge but a little too much like a generic chain restaurant with a fake fireplace and countless rooms for dining and a bar area. Final Thoughts: The Hawkeye Restaurant is the southernmost stop so far in the history of this blog. 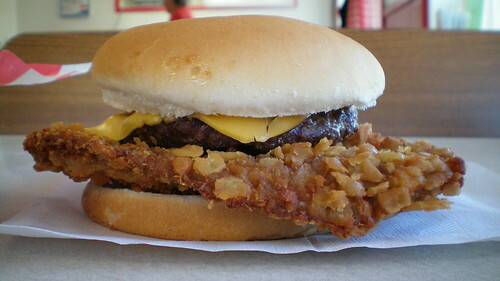 This starts my new route of Highway 61 tenderloins along the coast of Eastern Iowa. Just up the road are great tenderloins in Mediapolis, Augusta, Ft. Madison, Walcott, Davenport, Dewitt, and Balltown.